November 2012 – Sweet Feathery Jesus! If you could go back to one year in your life and re-live it, what year would it be? This is the daunting question we tackle on this episode. Also, Belasco finds another film to watch, Dr. P’s News Round turns into a beautiful love story and Booze explains to us the comedic richness of the ferret. Here at SFJ we applaud the brave gentlemen participating in Movember and in no way think that, far from it being any kind of hardship, they’re all secretly delighted to have an excuse to grow a moustache without anybody accusing them of being a homosexual sailor from the 1970’s. But you may not share our view of these hirsute heroes. Perhaps you think the event has been hijacked by a bunch of narcissistic ponces. That it’s become almost as annoying as Comic Relief. Maybe you think Movember has well & truly jumped the walrus. If this is the case, we suggest you shave the top of your head, leave the back and sides and join us for our new cancer fundraising idea. Next August, we’re introducing… Baldgust! 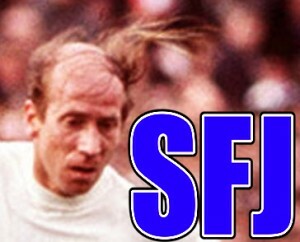 If you cultivate a combover, we’ll sponsor you double. Meanwhile, Booze shows off his fancy footwork, Belasco displays why he wasn’t invited to the Royal Wedding and Dr. P introduces us to a Chinamanwoman so devoid of a sense of humor that she gets all upset about being kidnapped at gunpoint and forced to dance around in her knickers. Even though it was all a joke! So… come on bald for Baldgust! 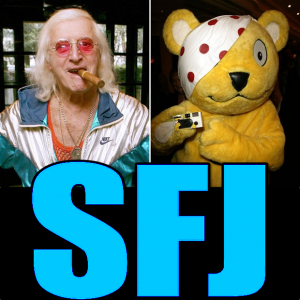 In this episode we discuss the molestation accusations of the late, British television personality, Jimmy Savile. Was Jimmy a bad boy? Booze helps us get down to the bottom of it. Dr. P tells us about a guy who got down to the bottom of a can of tuna. And, speaking of tuna, Belasco continues to stink up the joint with lame jokes and bad impressions. It’s everything you’ve come to expect from a .5 and LESS!